Awaken yourself and discover your true power during this exclusive healing and transformational retreat, only for an intimate group of 15 guests. Nestled in the serenity of the Aegean sea where island life meets luxury, you will enjoy yoga, meditation, relaxation, and deep transformation. Heal Yourself is a comprehensive yoga system designed to enhance the capacity of the emotional body while exploring the strength of the physical body. This week will provide you the space and time to focus on the spiritual and physical pursuits of your yoga practice. You will begin to unlock the fears that make you feel stuck and find a deeper meaning as you rediscover yourself. Bee will lead energizing and dynamic morning vinyasa sessions and gentle, introspective evening sessions. With guided meditations, pranayama, chanting and journaling, you will come back to what you have known all along, that everything you could possibly need is already within you. Bee holds a 500hr certification through The Kaivalya Yoga Method, in addition to various trainings from Yoga Medicine and Yoga Tune Up®. She is also a dedicated Vipassana meditator in the lineage of S.N. Goenka. Bee is also the creator of STAY, an online meditation course that has helped hundreds of students internationally start a contemplative practice as well as a lead mentor for yoga teachers who wish to stand out and refine their message and skills. Bee was born in Turkey, grew up in England, and has spent many years in LA and NYC, where she currently resides. Read more about Bee here! ACCOMMODATION OPTIONS | SOLD OUT! A 5 star luxury villa and a modern example of Cycladic architecture in Mykonos. 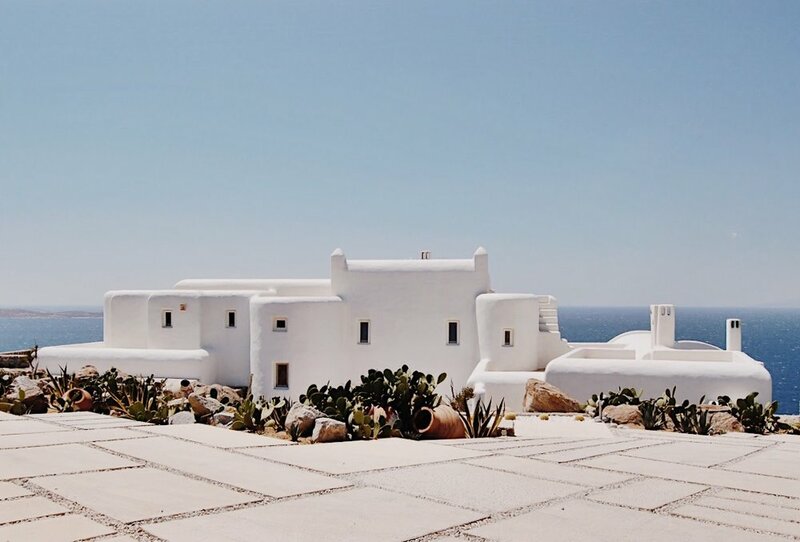 The highlight of the villa is the outdoor spaces gazing the Aegean and an infinity pool that spans from indoor to outdoor until it dives into the sea. Click for more images.